Life Every Day: A Happy Me, Who Needs YOUR Help! A Happy Me, Who Needs YOUR Help! This is my new apron! It will grace my kitchen (and my cooking self) next week! I have looked for a great apron for a really long time, and specifically tried to find a great one this past week in misc. stores, and there were many ordinary ones, but not "the one". "The one" that makes me giddy and happy about my morning meal prep time as I chop and grate for that evening meal, and that I get all happy about wearing while I make said meal, with four children around my feet. Andrea posted a picture of her adorable self in a great apron this week, so I asked her where she got it, hoping big it was in a store and not with sewing machine, because that is SO not an option for me. Bummer. She didn't make it- her mom did. Chances of Andrea's mom making me an apron? Slim. Until now I had totally forgotten to check out aprons on Etsy! What in the world was wrong with me?! Find this seller's site here, she has some great stuff! There are a LOT of super, super, super cute ones on Etsy. I had originally wanted a V-neck, but thought this would offer better shirt-protection. There are a ton of sweet ones that probably wouldn't have suited my needs as well, but may suit yours- some so cute I couldn't bear to just wear a T-shirt and jeans underneath! 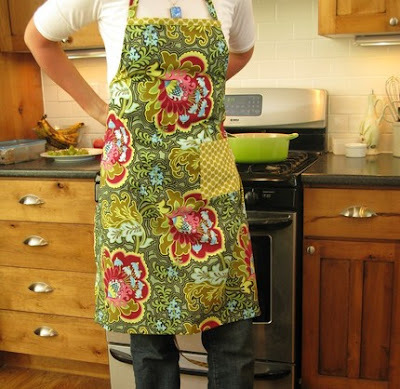 The colors and pattern are fabulous on this apron, and also dark, so when I splatter tomato sauce on myself (common) it won't show so well, and should wash easily. This was one of those purchases that makes me really, really excited. So worth the chunk taken from my budget. It's so "me". (Jim, I promise I'll take this out of next week's budget money... :) ). Ok, Ladies (and gentlemen?! ), here's where I need your help! Jim will laugh at me for buying a new apron. No, he won't be upset, but he will laugh. I know it. Now you have to comment and tell me how CUTE it is so I've got something to fire back at him when he does! It's very cute not to mention comparatively small compensation for all your cooking:) It looks like you've lost weight; you're looking great. that is an EXCELLENT point! it IS good compensation! It's a cute apron and congrats on winning the cookies ! Well of course it's cute - it's so cute I can barely stand it and make sure he knows that! Whoops. I'm not sure how to get my foot out of my mouth for that one. Sorry! really i can't believe he allowed you to even cook in that beautiful kitchen without that adorable apron!! I am QUITE sure that your cooking will be more creative, delicious, and quicker to the table once you are wearing that apron. Yes, I am quite sure. Hey - I saw the comment you made on my friend Deb's site pladsenfamily.blogspot.com so I clicked on your blog ... AWESOME. I love your recipes and I love your photos! Hey - thanks for checking out my blog. I LOVE yours. Your kids are beautiful and I lauged out loud at your 'fish' story a few posts back. :) Cute apron by the way - very unique! Tell him youll wear just the apron and nothing else! >:) just noticed someone else had the same dirty mind as me. good girl, lara! That's gotta be the best way to justify that purchase. Yes, it is very cute though! And will keep you from getting grease spots on your clothes, which is what I always do! Also, if you are chopping and grating dinner, you DESERVE a cute apron!!! OH I just LOVE your apron! It is beautiful! And seriously, with all of the money you will save on cleaning products to get tomato sauce out of your clothes, the apron will pay for itself in now time! I found your blog through two of my blog friends, Grandma B and Kristen. Although you have received lots of support to show your hubby, I thought I would add my two cents worth...... because as a retired home ec. teacher, I am an expert on aprons... and... I say this is a great one. It covers you well. It is easy to get off and on ... and ....with all the bright colors and nice pattern, Kristen is right,it won't hardly show any stains at all. Good choice! Have fun cooking away. If you need some good recipes I've found a great blog from a personal chef named Marie in England. She posts a new recipe everyday with pictures and a thought for the day. If you are interested you can check out her blog through the link on my sidebar. Yep the In Laws read this... but we were a young married couple once until we turned into the old married folks so....I hope you enjoy cooking in the apron. Jim should approve with all this encouragement. Wow...a lot of people read your blog. How fun to see all of these comments.